It is that time of year. When we have a hard time finding air because the schedule is so busy. Parties, kid-concerts, shopping, meal planning, travelling and so much more. It is easy to get lost in the festivities and forget to take a moment to remember the joy in the season. 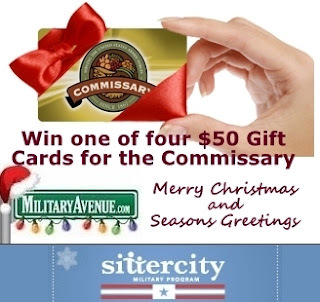 To help encourage and empower our military families SitterCity has presented us with four $50 Commissary cards to give to military-families! Wow, what a wonderful gift! To be entered for our random drawing tell us something you love about the holidays. Mention each of these new ways you have connected with us in your comment so we can put your name in "the hat" for each chance. Remember to we need to be able to contact you if your name is drawn on Friday, December 14th. So be sure to leave your email address in your comments as well. There will be four winners and each will receive one $50 card. My favorite thing about the holidays is spending time with my family and enjoy Jesus' Birthday! He is the reason for the season! My favorite thing about the Holidays is spending time with my family and enjoying Jesus' Birthday! He is the reason for the season! No trouble, Marie! We will enter your name in our drawing. Would you send a quick email to leanne@militaryavenue.com with your address. Sometimes FB isn't friendly with direct messages. I love the scents and food that come with Christmas and spending time with family. My favorite thing about the holidays is spending time with family and friends. Also the excitement shown by my 11 year old for the decorations, food, and celebrations is contagious! I love that the holidays isn't about a day on the calendar, but time with the family! I don't even know how many times we have had Christmas, not in December, but when we were ALL together! What I love most about the holidays is the spirit the season has. No matter what you celebrate, there is just this peaceful current of peace. Crazy family aside! lol. I love the holidays. The music, the smells, the food, the lights - just how everything seems to glisten. This year is especially special because my husband will be coming home from a 9 month deployment. I will email you privately with my email address for security reasons. I have also liked you on FB and followed you on Pinterest. Thanks, Jessica. I got your email. Good luck! I love everything about the holidays! But what I especially love this year is how excited my daughter finally is about the lights, Santa, presents, everything! My hubby will be deployed next Christmas so it feels extra special for that too. I liked your page on Facebook and am following your boards on Pinterest too! I love spending time with the family! The holidays are so much fun with lights, decorations, crafts and cooking/baking. I liked your page on Facebook and follow you on Pinterest too. The reason I love the holidays is because I love giving back to the local community and the base community as well. It is the best time to give to people who are less fortunate. Myself and my husband take in a few family friends each holiday season on CHristmas so they are not left without family to enjoy the holiday with. I of course love my family and friends. They are top priority in making them happy. So, holiday's are feel of cheer, even if it's far away from the ones I love the most. The way I have connected with you is on Facebook. We love the holidays because it gives us time to get together as a family and just spend some quality time together. With all the hustle and bustle throughout the year we always seem rushed. We love seeing the sparkle in everyone's eyes this time of year; not just the little ones but adults too! I enjoy the family time and the overall feeling of the holidays. I love everything about the Christmas season from putting up the tree, lights, and decorations to preparing for the birth of Jesus. Thanks for your answer, Jennifer! Be sure to either send me your email address via email (leanne@militaryavenue.com) or reply here, so that if your name is drawn we can contact you. What I love the most about the Christmas season is the lights. I "like" you on FB and I follow you on pinterest. Thanks for your answer, Michelle! Be sure to either send me your email address via email (leanne@militaryavenue.com) or reply here, so that if your name is drawn we can contact you. I also like you on FB and follow on pinterest. this past week i've been volunteering at the mountain post santa's workshop. helping other families have a wonderful christmas is one of my favorite busy, craziness of this season. Thanks for your answer, Jackie W! Be sure to either send me your email address via email (leanne@militaryavenue.com) or reply here, so that if your name is drawn we can contact you. My favorite part of the holidays is spending time with my family. This year is our first in the military and I'm so excited to visit my family so they can meet my newborn son. I like you on Facebook and follow you on Pinterest. Thanks for your answer, Alyssa! Be sure to either send me your email address via email (leanne@militaryavenue.com) or reply here, so that if your name is drawn we can contact you. Thanks, Alyssa. I got your email. Good luck! My favorite thing about the Holidays is the time spent with loved ones and getting their Christmas cards. This Christmas will be a very special one because I will spend it as a newly married couple with my husband! The holidays is a time to spend with family celebrating the birth of Jesus, the traditions each family forms. I liked on Facebook and follow on Pinterest. My favorite part of the holidays is the lights and the chance to spend time with the ones we love (even if we can not all be together during the season). Thanks for your answer, Steph! Be sure to either send me your email address via email (leanne@militaryavenue.com) or reply here, so that if your name is drawn we can contact you. My favorite time of the holidays is all the family time with friends and loved ones. Seeing the kids on Christmas morning. The newly fallen snow out in the yards or on the fields. Knowing that Jesus was born and lived for us and reading the story of his birth. Thanks, Elizabeth. I got your email and you are all set. Good luck! I love Holidays because it brings family together.I like Christmas movies, music, decorations and of course the FOOD!! I love the holidays because it reminds me whats truly important in life. The hussle and bussle all year long slows down for a just a few days!! I forgot to put that I like you on facebook and follow you on pintrest... I dont have a twitter acct though! Thanks for the contest! Every little bit helps! Especially on groceries! My favorite thing about the holidays is spending time with friends and family, cuddling on the couch with my love and relaxing with him while he is home. I follow you on pinterest and on Facebook. Thanks for your answer, Katie! Be sure to either send me your email address via email (leanne@militaryavenue.com) or reply here, so that if your name is drawn we can contact you. I enjoy celebrating Jesus' birthday and teaching my girls about Him. I also love spending time with family. Thank you! Be sure to either send me your email address via email (leanne@militaryavenue.com) or reply here, so that if your name is drawn we can contact you. My favorite part about this season is decorating the christmas tree and thinking about every christmas before hand. How things have changed, what things have remained the same. One thing that truly has remained the same is my respect for what the holiday is always about. Jesus' Birthday! Celebrate! I love Christmas and the holidays because it just feels so magical! I love Christmas music and spending time with family. I love spending time with my family and making new traditions with my family. I love to celebrate Jesus! I love to give Christmas gifts to our daughter and open the present from my husband. I love watching my twins faces light up when they see Christmas lights. Thank you, Christine! Be sure to either send me your email address via email (leanne@militaryavenue.com) or reply here, so that if your name is drawn we can contact you. Quite frankly, I just love the season in general: the happy faces, the friendly people, the lights galore, the wonderful music! And, my goodness, it is so much fun watching my 2 year old take it all in and seeing everything through his eyes! Truly amazing! We are stationed overseas and my favorite time of this holiday is that my boys and I can go home for Christmas and be surrounded by family! My hubby is deployed but at least we will have most of us. I love them!! My favorite thing about the holidays is spending time with family and the joy Christmas morning brings while watching my son open all of his presents. I like you on facebook, pinterest and twitter. I like you on facebook and pinterest. My favorite thing about the holidays is traditions with my kids, the tree and cooking their favorite treats. Although we have Facebook,email,and sophisticated phones, I still love love getting Christmas Cards. I especially adore the picture ones of family and friends! I love keeping them on display throughout the year and looking at all the people in our lives. I put them in photo albums when the next Christmas approaches. The kids love looking back through them and seeing how friends and family have changed through the years. My Favorite thing about the holidays are the traditons that my husband and I starting with our son and the overall spirit of the holiday. I have several things I love about the holidays. I love to see my children's face Christmas morning, family gatherings, Christmas lights & the overall joy of it all. I love our family traditions and spending time together during the holidays. I follow on Facebook, Twitter, and Pinterest. Thank you, Heather! Be sure to either send me your email address via email (leanne@militaryavenue.com) or reply here, so that if your name is drawn we can contact you. I love getting to share the traditions that my husband and I grew up with with our son and creating new ones for our family. I like you on Facebook and will send an email so you have mine. Thank you, Elizabeth. I received your email. Good luck! I already follow you on FB, and just added you to my Pinterest account. I'll be emailing you my email address. I love Christmas even more now that we have a daughter and it has been fun thinking of traditions for our new family. I love the cheerful Christmas music and the story of the birth of our Savior. The holidays is a time of HOPE for a better year & renewal of the things you hold dear! We love Christmas because we love celebrating Jesus' birthday, spending special time with family and just being together. I liked you on FB and Pinterest as well. my favorite thing about the holidays is putting up my lights. i love my kids reaction to them every year. I love spending time with my family and baking! The smell if fresh sugar cookies gets me every time. One of the things I love about the holidays are the smells! The smell of Christmas tree, baking cookies, and all the other smells that make the season are the best! I will send an email with my email address! Thank you! I received your email. Good luck. During this holiday season i just feel blessed to have my husband home with us and to spend time together as a family. Thank you, Brittney. I received your email as well. I love how just putting up decorations alone can put smiles on my families faces. Seeing their faces light up as the tree is lit is priceless. Thank you everyone for all your entries! We drew four random winners. Congrats to Jessica, Katie, Jackie V and Ashleigh. Check your email boxes for your winners notifications. 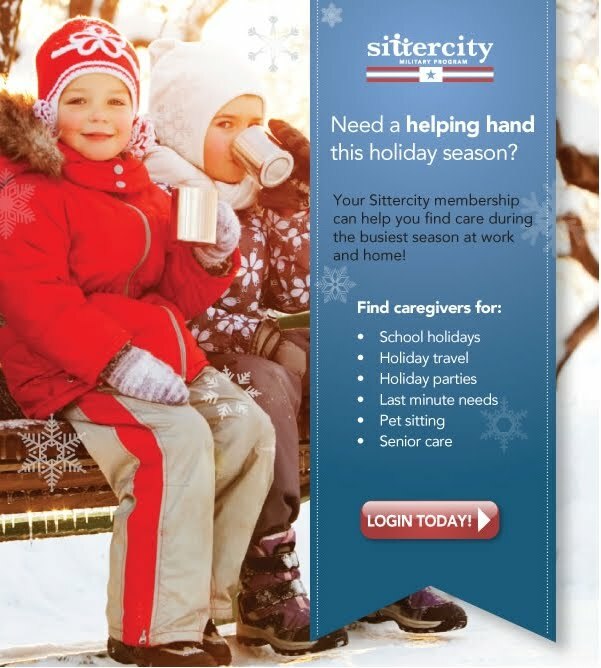 Merry Christmas to all from MilitaryAvenue.com and SitterCity.